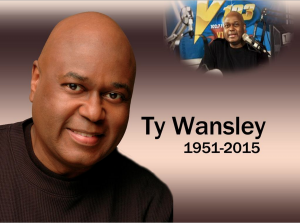 NABJ-Chicago mourns the passing of legendary radio news journalist and talk show host Thaxter “Ty” Wansley. A memorial service is scheduled for Friday, May 22nd, at 11:00 a.m. at Progressive Community Church, 56 E. 48th St. in Chicago. A memorial service also was held in his hometown, St. Louis. Wansley, 63, died on May 6 at Northwestern Memorial Hospital. He reportedly had been admitted for treatment of congestive heart failure and related illness. Wansley was a news anchor and talk show host in Chicago for more than 35 years. Most recently, he was news and information director for WGCI FM 107.5, WVAZ FM 102.7 and gospel WGRB AM 1390. He anchored morning news on V103 and WGRB and hosted two weekend public affairs shows, “Chicago Insight” on WGCI and WGRB, and “Chicago Speaks” on V103. Wansley began his broadcasting career as a radio newsman in St. Louis after graduating from Jefferson Community College in Hillsboro, Missouri. He moved to Chicago in 1979 to join the former WBMX (now V103) and WJPC. He later hosted “Tell Ty” on urban news/talk WVON AM 1690 and “Urban Street” on Weigel Broadcasting WCIU-Channel 26. Wansley is survived by two brothers, Larry and Danny, and a host of broadcasting colleagues and friends.